Having rats is tough. My Mom frequently asks me why I have rats. Not because she thinks they're gross but because they live such short lives and the pain of losing them is so hard for me. Many days I wonder the same thing, even the potential thought of losing one of my little angels is hard on me. As time goes on though, I think I'm starting to understand more and more why I keep putting myself through the torment. Unlike longer lasting relationships I never, even for a moment, take my rats for granted. Subconsciously I know that they could be gone in a flash so I love them with all my heart. That understanding has really put life into perspective for me. Rats aren't the only things that can be gone in a flash. I try to treat my friends, family, even strangers the way I treat my rats, like they could be gone in a flash. I just want to make sure I take the time to let everyone know that they are loved! With that in mind, share some love today, tell someone how special they are or just send them a message to let them know you're thinking about them. One thing that I've discovered since falling heart first in love with rats is that I'm not the only person in the world that adores rats. We are fortunate to have such a strong community, the underdogs if you will! It amazes me something so small could bring so many people together. However, many of us are part of relationships with people that don't really “get” us. Because of that tiny subculture that we find ourselves in, it's really hard to find cute rat collectibles! I look forward to Halloween in hopes of finding lots of rat stuff but, how much "scary" rat stuff could I possibly need?! Secretly the answer is 'all the things ever' but that's beside the point! Each year for Christmas and my birthday I make a list from The Travelin' Rat Store for my family of all the things I want. They really do have a lot of unique gifts. I'm really impressed that the store is up and running and much more functional than it was. So stop on by, check it out, make that list, share this picture! 1. What did you think about rats before you met me? 3.When did you realize that we were going to be a pet centric family? 4. How does having rats positively (or negatively) affect our relationship? 5. What, if any, changes have you noticed in me since I fell in love with rats? For better or for worse? 6. After years of living with me and my rats, how do you feel about them? I wrote up an "interview" for my significant other about what else, rats! I also sent it to my cousins husband because I was curious. At the bottom are the questions if you want to copy and paste them to send to someone special in your life. The answers might surprise you! Q:What did you think about rats before you met me? A: I had no strong opinions. I did know that in terms of genetics and evolution they are more like us than typical pets, cats, dogs, horses, etc. A: I discovered that they were much more affectionate than I expected. Q:When did you realize that we were going to be a pet centric family? A: From the start. You have had pets your whole life. Q: How does having rats positively (or negatively) affect our relationship? A: They were a bonding experience since we started raising them together. Q: What, if any, changes have you noticed in me since I fell in love with rats? For better or for worse? A: You are more open minded about exotic animals and have come to grips with pet deaths. 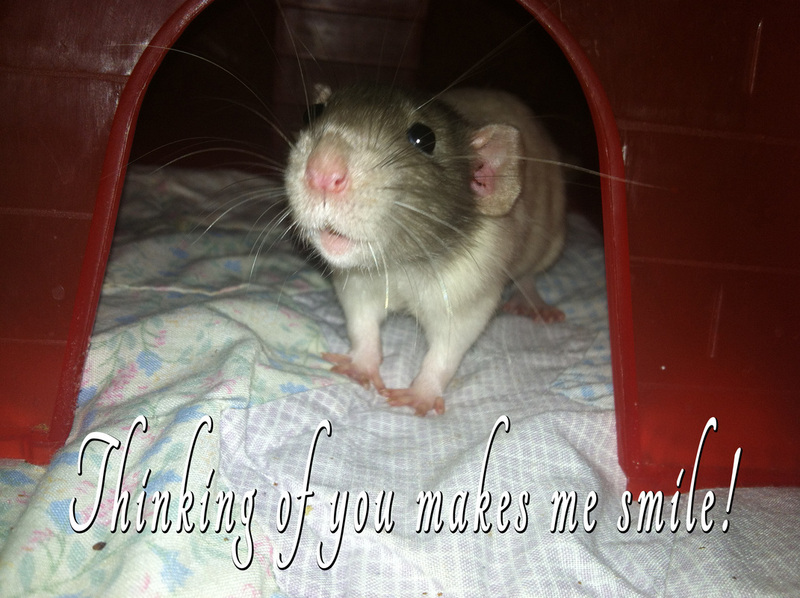 Q: After years of living with me and my rats, how do you feel about them? A: Love them. They have been and continue to be a rewarding experience. Just like you. A: I was pretty much indifferent to them. A: I thought that he was more personable than other rodent pets I'd had in the past. Q: When did you realize that we were going to be a pet centric family? A: I don't think it has affected it. A: I haven't noticed any change really. A: I love them like I do all our pets. Why is it that even though you have igloos, box castles, tubes, and hammocks to play with you just sleep all day? We're saving them for something special. We can't tell you what, but it's going to be great. Do you ever perform experiments on your rats? I do. I like to watch how they interact with me and with each other. One "experiment" I've been working on is trying to figure out if rats are 'racist'. The most rats I've had at one time though is 5 so I don't have a reliable test group to work with. I have however, heard people say that rats are more likely to socialize with other rats of similar color or markings. I wonder if there's any truth to that. I have noticed that each rat has a unique personality regardless of social status. Some rats are adventurous, active, snuggley, solitary, or domineering. Which leads me to my other "experiment", are rats with fuzzy coats more human friendly than rats with sleek fur? What have you noticed about your rats? 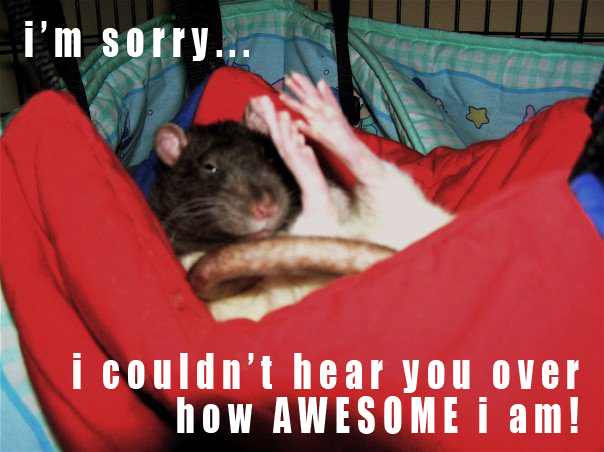 I think we can all agree that rats are truly remarkable little creatures that we will never fully understand. Regardless, I hope to spend the rest of my life trying to! Why do you pee on everything? Your mum, your brothers, the 'everything ever'? People might tell you that it is because I'm marking my territory but, I'm telling you that it's because I can. I love the internet. I mostly love cute animal pictures and honestly, I'm probably that friend on Facebook that you hide from your news feed. I thought about interesting topics, news articles, even something heartfelt and meaningful. Then I thought I should keep it simple. So what better way to relaunch the TTR blog than with a video of a cute rat?! ~Travelin' Rat A.